One thing was clear after Wednesday night's second GOP primary debate: Carly Fiorina should have been invited to the first one. Several times throughout the marathon CNN showing, Fiorina took on her fellow GOP candidates, showing up the very men she had been lagging behind in the polls. Whether or not Fiorina's performance will help bolster those same polls numbers remains to be seen, but there was no doubt in anyone's mind at the close of Wednesday's showing that the former Hewlett-Packard CEO had left the debate stage better off than all of her counterparts. Fiorina made a few punches right out of the gate, delivering a scathing critique of rival Democrat Hillary Clinton's support of Planned Parenthood despite a series of videos (that were deemed to be manipulated) that allegedly showed the organization's top officials describing the supposed sale of fetal tissue for cash, while simultaneously making her fellow candidates' answers seem tame in comparison. "I dare Hillary Clinton, Barack Obama, watch to these tapes — watch a fully formed fetus on the table, its heart beating, its legs kicking, while someone says, 'We have to keep it alive to harvest its brain,'" said Fiorina, who argued that the government ought to be prepared to shut down in order to defund the nonprofit. "This is about the character of our nation." "Immigration Reform Did Not Come Up Because Of Mr. Trump." Despite Trump's insistence that the GOP's obsession with illegal immigration stemmed from divisive comments he made in his original campaign announcement this past June, Fiorina vehemently argued that the issue had been around much longer. "Immigration reform did not come up in the debate because of Mr. Trump — we have been talking about it for 25 years," said Fiorina, who also used the spotlight to blast President Obama and Democrats for not "do[ing] anything to solve the problem" of illegal immigration. Pressing Trump, who had previously promised to get rid of birthright citizenship, Fiorina argued, "The truth is, you can't just wave your hands and say 'the 14th Amendment is gonna go away', it will take an extremely arduous vote in Congress, followed by two-thirds of the states, and if that doesn't work to amend the Constitution, then it is a long, arduous process in court." "I Think Women Heard [...] What Trump Said"
Highlighting Trump's comments from last week, in which the billionaire mogul told Rolling Stone that no one would vote for Fiorina because of "that face", moderator Jake Tapper prodded Fiorina for a reply, saying, "Mr. Trump later said he was talking about your persona, not your appearance; Please feel free to respond what you think about his persona." "I think women all over this country heard really clearly what Mr. Trump said," remarked Fiorina coolly, eliciting raucous cheers from the audience. "I Think Track Records Are Very Important"
After Trump and Fiorina faced off over their extensive business careers midway through Wednesday's debate, New Jersey Gov. Chris Christie interjected, exhaustively demanding that the two move on to another topic. "Jake listen," Christie said, addressing the CNN moderator. "While I'm as entertained as anyone by this personal back-and-forth about the history of Donald and Carly's career, for the 55-year-old construction worker out in that audience tonight who doesn't have a job [...] could care less about your careers, they care about theirs." Christie then sarcastically congratulated the two on being successful. Well, I thought we had been hearing quite a bit about Governor Christie's record [...]. I think track records are very important. I completely agree that what's at stake here is the future of this nation, and the future of every American. But I do think that a track record of leadership is vital because in the end this election is about leadership. And let's talk about what leadership is. It's not about braggadocio, it is about challenging the status quo, solving problems, producing results. And the highest calling of leadership is to unlock potential in others. Separating herself from rival Trump's accusations that she ran HP into the ground during her tenure as CEO and was subsequently fired for her dismal efforts, Fiorina swiped back eagerly, dropping a big name into the mix. "... I have been very honest about [my dismissal as CEO] from the day it happened," said Fiorina, firing back at the brash billionaire. "When you challenge the status quo, you make enemies [and] I made a few, [but] Steve Jobs told me that when he called me the day I was fired to say, hey, been there, done that twice." 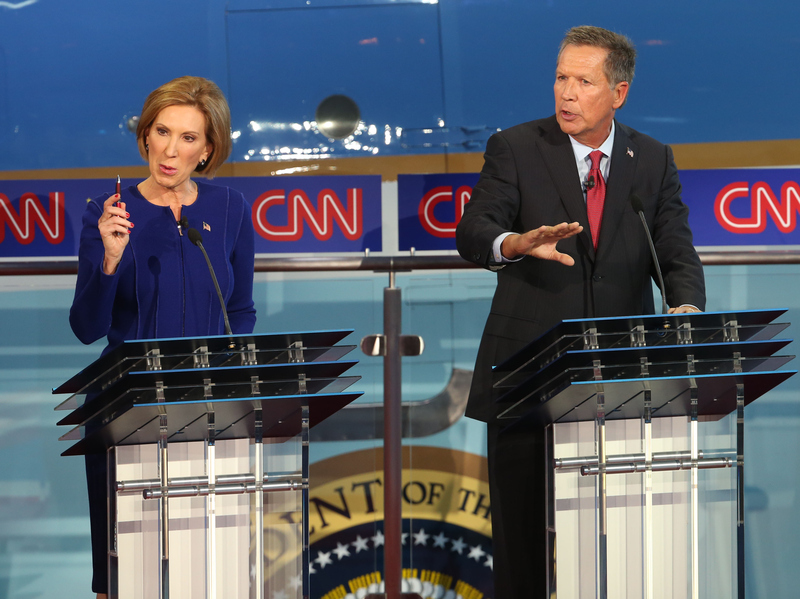 "Drug Addiction Is An Epidemic"
Not all of Fiorina's epic comebacks on Wednesday night were as aggressive. After Jeb Bush sheepishly admitted that he had smoked pot as a young man some 40 years earlier, Fiorina took the opportunity to poke fun at the former Florida governor in her own response on drug reform, saying, "The marijuana that kids are smoking today is not the same as the one that Jeb Bush smoked 40 years ago." Fiorina also used the moment to fully explain her feelings on the matter of marijuana legalization, pulling from her own tragic history in one particularly humanizing moment. "My husband Frank and I buried a child to drug addiction," said Fiorina. "... We must invest more in the treatment of drugs." "Women Are Not A Special Interest Group"
I wouldn't change the $10 bill, or the $20 bill. I think, honestly, it's a gesture. I don't think it helps to change our history. What I would think is that we ought to recognize that women are not a special interest group. Women are the majority of this nation. We are half the potential of this nation, and this nation will be better off when every woman has the opportunity to live the life she chooses.